The swim start and finish are below the transition area on the grass directly behind the Hill Country State Bank (HCSB) and the Kerrville Sports Center, located on Junction Hwy, just north of Guadalupe St. The first transition area (T1) for all events is located in the grass behind Hill Country State Bank, across the street from Inn of the Hills. 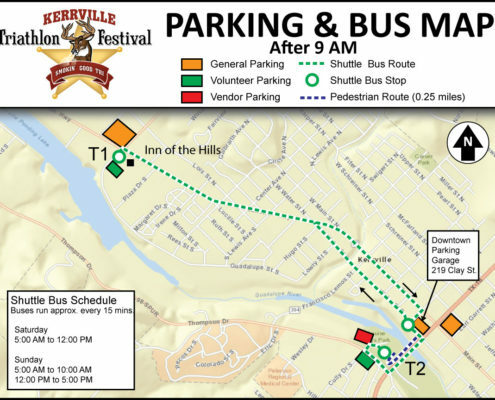 The second transition area (T2) is located in downtown Kerrville at Louis Hays Park. The finish is also at Louis Hays Park. Parking for the Expo and Packet Pickup is available at the Inn of the Hills, 1001 Junction Hwy (SH 27). Race Day Parking will be available at near the Family Sports Center for the Swim and Bike Start, and at locations near the finish line. Shuttle buses will be provided in the morning on race day to transport athletes and spectators from the parking lots near the finish line to the swim start and T1. It is recommended that participants park near the finish line at the downtown garage in the morning and then take the shuttle bus to the swim start, or arrange a ride with a spectator. This way you can easily walk your bike back to your car after the event. If you are staying at Inn of the Hills – you can walk over to T1 and then take the shuttle down to T2 if needed and then back from T2 following the event. For spectators wishing to drive – You can park at Inn of Hills in the morning and then drive north and take a left on Thompson Dr. Follow this down and park across the street from Louise Hays Park at the mall. Driving Directions Map. Shuttle buses are open to everyone including spectators. While bikes can go on the shuttle it is not recommended. If you parked at T1 take the shuttle back to your car and then drive back to pick up your bike.